When you’re sitting in the dental chair looking up at your dentist, what runs through your head? Many patients can recall trying to decipher exactly what their dentist is talking about when they spit out a slew of dental terms. If this scenario sounds familiar, your dentist in Fort Lauderdale is here to help you better understand exactly what your dentist is talking about during your appointments. This week’s blog post is dedicated to decoding your dentist’s common dental terms, so you can effectively communicate with your dental team. Periodontal disease is the advanced form of gum disease. Each day, dental bacteria stick to the surfaces, crevices of your teeth, and along the gum line in a sticky film known as plaque. If the bacteria aren’t effectively being removed or not being cleaned often enough, the plaque will harden to a substance known as tartar, which can settle below the gum line. If the condition isn’t addressed, the disease will continue to advance, affecting the health of your teeth, gums, and could even lead to tooth loss. One of the reasons your dentist completes dental x-rays is to see the alignment of your bite. Your top and bottom arches of teeth should align perfectly so that they touch when you chew and speak. When teeth don’t align perfectly, you may need a bite adjustment to avoid dental problems like wear and tear, enamel erosion, TMJ disorder, and dental trauma. Your dentist can explore orthodontics with you, bite guards, and even occlusal adjustments if necessary. If you’re sitting in a dental chair and hear the mention of root canals, your heart might skip a beat—and not in a good way. There’s no need to be nervous because root canals work to save teeth. When a tooth becomes infected, the bad dental bacteria and debris may seep into the tooth. Once the infection reaches the root of the tooth, the root can become inflamed and cause pain. Root canals are a way for your dentist to remove those infectious materials from the inside of your tooth, finishing the procedure by sealing it from further infections. 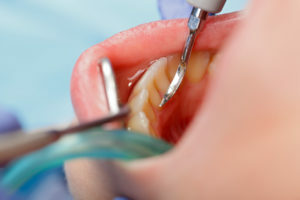 Dental fillings are meant for teeth that have minor decay or damage. If you’re experiencing discomfort from a small cavity or chip in your tooth, your dentist will probably recommend getting a tooth-colored filling. Your dentist removes any decayed areas of the tooth and debris. To complete the procedure, your dentist will fill the damaged area with tooth-colored composite resin. Your dentist will always work to save your natural smile, but there are a few cases in which pulling your tooth may be necessary. If you have a severe infection that will affect the rest of your smile, an alignment issue caused by overcrowding, or if your tooth has suffered from a traumatic injury, your dentist may recommend an extraction. Remember, your dentist is here to help you keep your smile healthy no matter what and will make the most effective recommendations to keep your natural teeth strong. If you ever have questions about what a term means, feel free to ask! Here at Mingel Dental, we value our patient’s comfort. We want to create long-lasting relationships with everyone that visits our office and the best way to make each of our patients feel comfortable is to openly communicate with them. If you need help understanding a treatment or procedure, don’t ever hold back your questions. We’re here to help every step of the way!